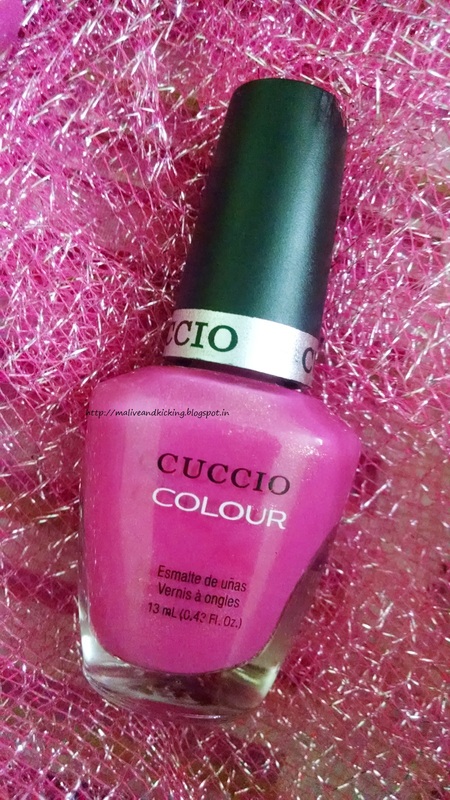 Cuccio Nail Polish is formulated with Triple Pigmentation Technology for rich coverage in one coat and true coverage in two coats. 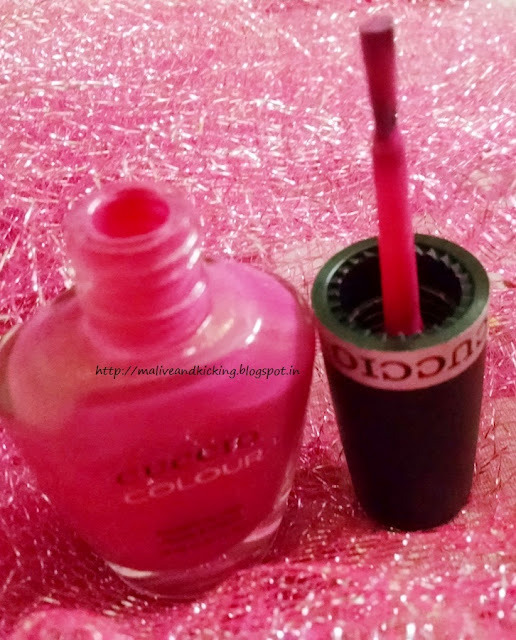 A superior long lasting nail polish for natural nails. 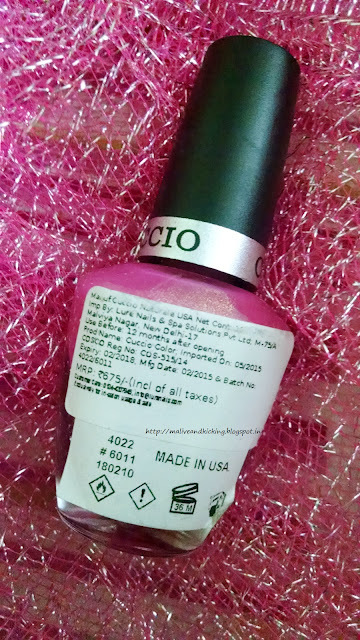 In my Fab Bag, I received the Cuccio Nail Polish Shade 6011 called as Totally Tokyo. It comes is a robust glass bottle. The label on the bottle reads the details of price (Rs. 675), shelf life (3 yrs) and qty (13ml) etc. The label on the bottom of the bottle mentions its shade number as well as specific shade name. It is in fuschia color with slight gold shimmer. 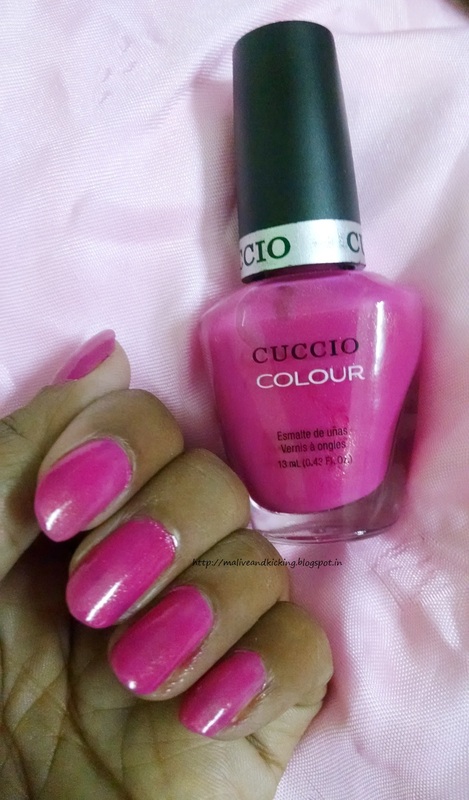 The color is very vibrant n catchy girly shade that would be quite adored by women of all ages. The nail paint is claimed to be Professional Nail Lacquer that gives rich coverage in single coat. As I applied the nail paint using the decently broad applicator brush on my nails, it gave nice finish. It require a wait of few minutes to get it dry being slightly thicker in consistency. I usually prefer true coverage on my nails, so decided to go for dual coat. This is how it turned out after double coat. The nail paint has very good staying power. It gives only minor fading after 4-5 days of application. I am happy with the performance. But looking at the high price, I would not buy it again unless and until there is huge discount on it. Colour of nail paint is looking good. Such a lovely shade. I love it so much !!! Lovely bright shade. Looks amazing.